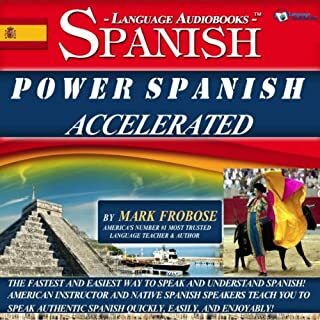 I love the way this program Power Spanish takes the many words that it teaches and gives you lots of practice showing you how to put them all together correctly into different sentences with a lot of originality. You can learn words from any Spanish dictionary. The great thing about this program is that it shows you how to put them all together to express your own thoughts and desires. I have never seen this in any other program and I am excited about how fast I am learning to speak Spanish. A huge amount of words, phrases, and short statements are first taught, then reviewed by a variety of native Spanish speakers. Once again, all are presented so that they may be easily used in useful daily conversation with a reasonable degree of originality. There is enough information here to keep you busy learning for many, many hours to come. Good, good audio program if you want to improve your pronunciation and learn to speak more fluently, like a true Spanish speaker. 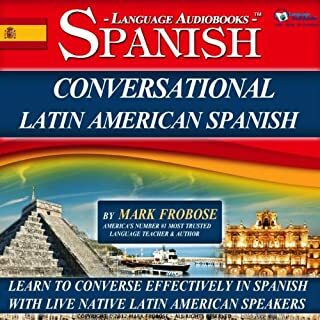 I bought this audio program called Conversational Latin American Spanish 1. It is much better than a cd program I bought from another company years ago. It is not dry and boring like the first one tended to be. The speakers used on the program are easy to understand and copy when you are repeating what they are saying. That is the greatest thing about it for me. I appreciate the consideration that the developer of this program gives to the learner in explaining the details of Spanish and having the native Spanish speakers repeat at different speeds. The native Spanish speakers say things slowly and then at normal speed. That is such a great help in learning to speak correctly. You can’t learn to say things right if you can’t understand what is being said. You CAN understand with these speakers on this program. They teach a lot of words and phrases about a lot of different topics. The direct conversation practice really helps in learning to speak comfortably. It is all very useful if you go to any country where Spanish is spoken. As you learn the material you are also learning how to use it. That makes it fun to learn and makes you want to keep learning more.